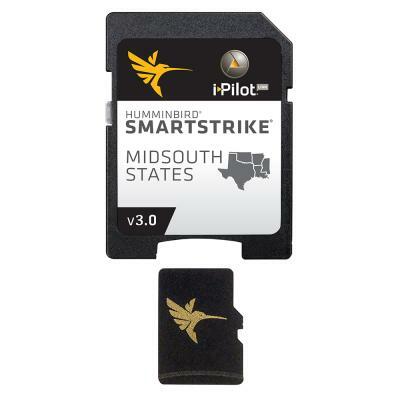 The SmartStrike MidSouth Edition, Version 3 microSD map card (mirrors the LakeMaster MidSouth Version 4 product) has added over 80 new lakes, with 55 additional High Definition waters. This edition now boasts contours for a total of over 360 lakes with more than 250 lake maps in High Definition for Texas, Oklahoma, Arkansas, Louisiana, and Mississippi. With a SmartStrike card used on wide range of Humminbird models, anglers have the special capability of using the Contour Elite search functions on (and only on) any of the High Definition lake maps for that card. It's like looking into a digital crystal ball. Humminbird SmartStrike takes you straight to the action by showing you where the fish are biting at any given moment. Based on search parameters like fish species, season, time of day, and weather conditions, the SmartStrike engine searches depth ranges, type of structure, proximity, and more to highlight areas on High Definition lake maps where your prey is most likely to be located- before you even wet a line. Build a custom search based on criteria you choose, or click any location on a lake, select Find Similar Areas, and millions of data points are searched to return other areas like it. No more guessing, fruitless searching, or wasted casts. Just fishing.